Enhanced oil recovery (EOR) technologies remain significant to the global oil supply through their ability to increase or revive oil production at reserves or oil fields depleted of more easily recoverable oil. In other instances, EOR technologies have allowed oil production from alternative reserves (such as oil sands or oil shale) through field operations once thought to be technologically infeasible or economically unviable. Although overshadowed by unconventional extraction techniques such as horizontal drilling and hydrofracture, EOR remains a significant toolset in the portfolio of available extraction technologies. One company is tapping nature to play a key role in developing an environmentally friendly technology that could significantly raise the recovery rate of reservoirs. Wintershall, a German oil and gas company, is exploring the fungus Schizophyllum commune for use in polymer flooding, a chemical EOR method in which a thickening agent is added to water to create a more viscous fluid. The viscosified water is injected into the oil reservoir to push more oil to the producing wells. Known by its common name as the "split gill mushroom," Schizophyllum is found on rotting wood in forests throughout the world. It feeds off oxygen and various carbon sources like sugar. 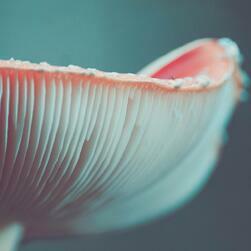 As the fungus grows, it generates a biopolymer used for developing its own cell walls. The thickening agent is prepared exclusively for Wintershall by BASF, its parent company. The fungus and a sugar solution are stirred in a fermenter for several days and aerated with oxygen, according to Wintershall. During this process, the fungus produces the biopolymer, which is then separated from the fungus and cleaned for use in the oil field. One way of increasing the amount of oil is to reduce the mobility of water in relation to the mobility of oil. A polymer like Schizophyllan accomplishes this by mixing it with water, creating a solution that contains about 0.03% biopolymer, enough to thicken the water by a factor of 25, reports upstreamonline.com. The thickened water thus presses more oil out of the rock pores as its makes its way through to the reservoir. In other words, the water forces more oil out of the reservoir because it can no longer flow past the valuable natural resource as easily. Wintershall claims the use of Schizophyllan could increase future recovery rates by about 35-45%, a huge gain over current recovery rates. The researchers say that the biopolymer tolerates high temperatures and retains its mechanical stability in high salinity, two conditions often present in oil reservoirs. An added benefit is the biopolymer is completely biodegradable. "The technology could be an effective enhanced oil recovery (EOR) tool in certain reservoir conditions," Klaus Langemann, head of technology at Wintershall, tells upstreamonline.com. "Chemically derived polymers typically don't show this stability, and show mechanical degradation under shear stress." The company plans to extend Schizophyllan trials to other oilfields, including offshore projects. BCC Research reports that the global EOR market, which totaled nearly $22.9 billion in 2016, is expected to reach $30.4 billion by 2021, demonstrating 5.9% CAGR through 2021.